Marwah Maqbool Malik of Oxford Policy Management introduces the Financing Framework for Resilient Growth and some lessons learned from its application in Pakistan. Pakistan has been declared the seventh most vulnerable country to climate change: with an estimated 141 extreme weather events from 1997-2016 resulting in US$ 3,800 million of economic losses (0.6% per unit GDP) and hundreds of deaths (German Watch, 2018). Among the important responses by the Government is the Climate Change Act of 2017. However, like most developing countries, there is a crucial ‘implementation gap’ in terms of turning policy and commitment into action on the ground. Given Pakistan’s vulnerability to climate change, there is an urgent need to explore and implement adaptation strategies in the country, with additional finance. Pakistan’s adaptation needs stand at US$ 7-14 billion and hence merit a comprehensive approach to accessing and spending both domestic and international climate finance. The availability of financing for climate change adaptation is a major constraint on the Government’s ability to put the Climate Change Act into practice. Domestic resources dedicated to climate change have historically stood at a mere 8% of the development budget. Reasons for this include: a weak Federal Ministry of Climate Change, which lacks influence to leverage domestic resources; a lack of knowledge and capacity within provincial departments to advocate for and address climatic issues; and a lack of priority accorded to climate change in strong government agencies, such planning departments, finance, etc. Pakistan’s share of the available international climate finance has also been very low, relative to other climate-vulnerable countries. This is primarily because the Ministry of Climate Change lacks the technical expertise to align with international climate financing modalities and so had many funding proposals rejected, and because climate change related government departments, NGOs and private entities lack the knowledge to develop ‘investment-ready’ or ‘bankable’ projects. Action on Climate Today (ACT) is a regional DFID-funded programme that has attempted to provide a solution to the adaptation financing needs in South Asia by developing a Financing Framework for Resilient Growth. The five elements of the framework are flexible and adaptable for locations around the world and seek to bridge the gap between adaptation needs and existing resources, both in terms of financial resources and institutional processes and mechanisms. The framework includes five key steps, as shown above. 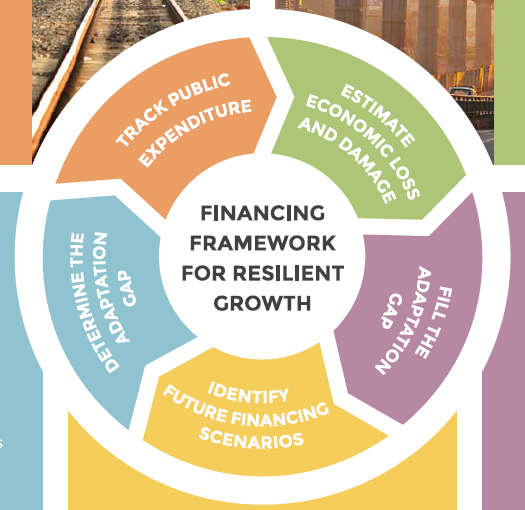 More details about the framework can be found on the e-learning platform https://financingresilientgrowth.org. ACT’s programme in Pakistan draws from the Financing Framework for Resilient Growth and focuses on one element of the framework: filling the adaptation gap. Since UNDP is already supporting climate tracking and budgeting, ACT’s focus in Pakistan has been directed towards leveraging new sources of climate finance and institutional strengthening and capacity building to access and utilise international and domestic climate finance. The latter has involved efforts at both the Federal level (Ministry of Climate Change) and provincial level (with line departments). Bringing together national (and international) stakeholders and providing technical support for developing bankable projects for international funds, such as the Green Climate Fund, Global Environment Facility and Adaptation Fund. Delivering training to provincial planning and line departments to build their knowledge about international financing options, and developing their skills to produce bankable projects. Over the last few years, the Climate Finance Unit has leveraged around US$ 101 million from international funds such as Green Climate Fund and Global Environment Facility; this includes co-financing pledged by provincial governments and departments. Climate finance readiness activities have received support as well as a project to build resilience to glacial lake outburst floods (US$ 37.5 million). There is also an active pipeline of projects for submission to these funds and others, which include initiatives on climate smart agriculture that have been jointly developed with implementing partners such as UNDP, GIZ, UNEP, FAO, etc. – Most of ACT’s support to partner governments has initially focused on accessing international climate finance. However, this has often prompted governments to identify and commit additional domestic resources, as co-funding for project proposals. – It is paramount to strengthen domestic institutional capabilities to access and manage international climate finance, as well the delivery capacity of sectoral ministries and agencies. – Governments often find it easier to understand climate impacts when they are translated into economic costs, and quantifying the potential adaptation benefits of different policy options helps officials choose between competing priorities. – It is important to find the right government agency to lead the process of managing finance for adaptation – usually a high-level agency with a cross-sectoral mandate (e.g. a Prime Minister’s Office or Ministry of Finance). Pakistan’s experience shows that the Financing Framework for Resilient Growth is a useful framework, if adapted and applied in a way that meets the local context. CDKN occasionally invites guest bloggers to contribute their ideas and analysis on our website. Their views are their own and do not necessarily reflect the opinions or endorsement of the CDKN programme or any of its organisational alliance members.